Building on the award-winning original, Comet Crash 2 is packed with a new campaign, online and offline multiplayer, and solo or cooperative gameplay against the new boss: the Kronkoid. Comet Crash 2 will have you strategizing with friends and family as you play through a challenging campaign of over 50 action-packed missions. Then jump into multiplayer battles to put your strategies to the test against other humans. Go online and invite friends to help navigate through the campaign or team up in an online battle. You can even bring more local players online for "couch-vs-couch" gameplay. More adrenaline? Get competitive and build your rank in online 1v1, 2v2, and Free-For-All battles. As you gain XP for playing online, you level up and unlock ship upgrades. Defend your territory with a variety of weapons. Use specialized units to fight off attacks and rush your enemies with massive armies. 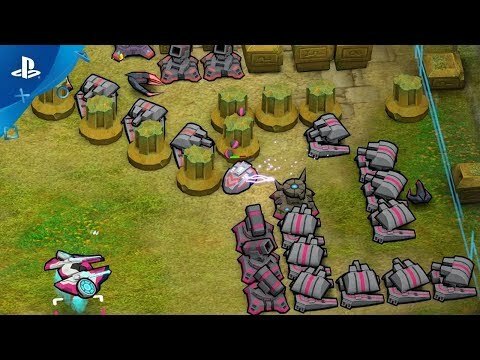 Destroy the Kronkoid bosses and collect Zoids to supercharge your weapons and units. Play the long game by researching upgrades, such as vengeful swarms and long-range missiles. The limitless variety of strategies will have you coming back to be challenged again and again. Experience the evolution of the award-winning Comet Crash gameplay. Rapid synthesis of complex machines became possible with advancements in Thorium resource processing. Thorium Synthesis was a turning point for space travel by enabling machines to self-repair and replicate. By turning comets into vehicles, Thorium Synthesis revolutionized planetary mining operations. For centuries, mining operations were carried out peacefully by several civilizations. Kronkoid battleships were first discovered near Planet Kulin. These operations drove waves of comets toward several populated planets. Join the fight and stop the reckless Kronkoid from destroying innocent civilizations. Online modes include 2 local players vs. 2 remote players, AKA "couch-vs-couch." Solo or up to 3-player cooperative gameplay. An RTS with lots of interactive action. Fight over rocks with other players, team up for double attacks. Send waves of 1000s of varying units. © 2017 Pelfast, Inc. All rights reserved. Comet Crash is a trademark of Pelfast, Inc. All other trademarks are the property of their respective owners.